1. Concentration: The ore is concentrated by froth floatation process. 2. Smelting in a Reverberatory furnace: The concentrated ore is roasted in a reverberatory furnace at a moderate temperature. The temperature of furnace is controlled by regulating the air supply. During roasting, galena is partly oxidized to lead monoxide and partly to lead sulphate. More of galena is then added. The temperature is raised and simultaneously the air supply is reduced. Lead sulphide reacts with the two oxidised products giving lead. recovered from the slag by heating with lime and powdered coke. Lead extracted by the above method contains impurities such as silver, copper, tin, bismuth, gold and iron. It is refined by the following processes. The impure metal is heated on a sloping hearth. Lead melts and flows down the slope. The infusible impurities remain on the hearth. Silver is removed by either Pattinson's process or Park's process. 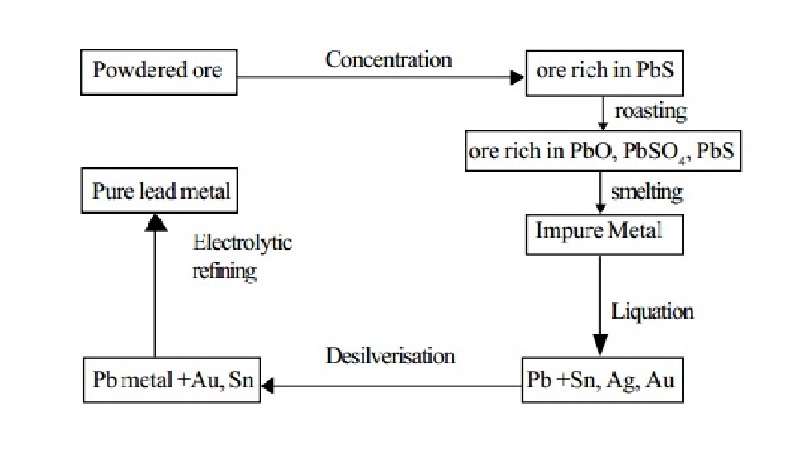 Very pure lead is obtained by this process. The metallic impurities which are more electropositive than lead, such as iron and tin, go into the solution while the rest of the impurities are thrown down as anode mud. 1. Lead is a bluish grey metal with a bright luster. 2. It is soft and can be cut with a knife and drawn into a wire and rolled into a sheet. 3. It is not a good conductor of heat and electricity. It marks paper. i. It is unaffected by dry air but in moist air a layer of lead carbonate or lead hydroxide is deposited on its surface which protects it from further action of air. Lead is not attacked by pure water in the absence of air, but water containing dissolved air has a solvent action on it due to the formation of lead hydroxide (a poisonous substance). This phenomenon is called Plumbo solvency. i) Dilute H2SO4 and HCl have no action on lead. of an insoluble layer of lead sulphate. An element A belongs to 14th group and occupies period number 6. A reacts with conc. HCl. to give B an acid. A is used to prepare C which is used as an antiknock in automobiles. Identify the element A and the compounds B and C Write the reactions. ∴ Compound B is chloroplumbic acid. 3. Compound C is tetraethyl lead.